Mechanococcus ciliaphorus is a unicellular organism isolated from subsurface oceans of Dagon 3 (figure 1A). It is of sperical shape with diameters between 20 and 50 µm. The genetic and biochemical basis of M. ciliaphorus is largely unexplored; the organism is characterized by a complex internal organization comprising various systems of dynamic vesicle. 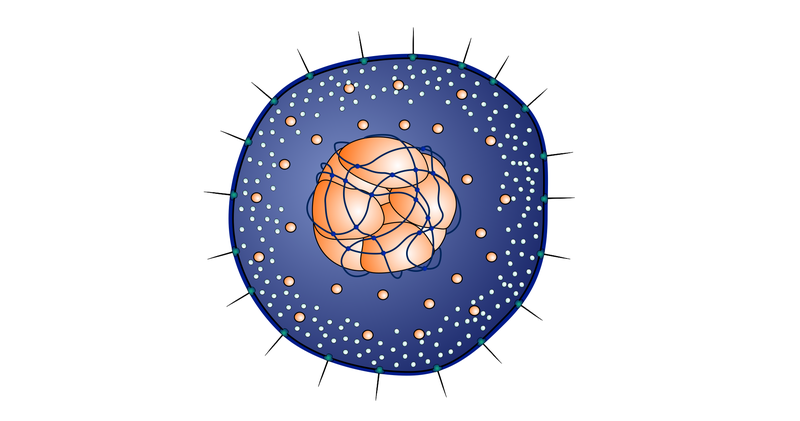 Furthermore, it is surrounded by a multi-layered cell wall with embedded cilia. Cilia are between 1 and 2 µm long, extend vertically from the organism’s surface and are not moving actively (figure 1 A, B). M. ciliaphorus usually has 100 – 600 cilia distributed evenly over its surface. M. ciliaphorus can be cultivated under axenic conditions with media simulating chemical composition of Dagon 3 subsurface oceans. Mechanical agitation is critical for survival of M. ciliaphorus, since organisms in undisturbed cultures die off after a few hours. Under strong and continuous mechanical agitation, however, M. ciliaphorus could be propagated in vitro with generation times of down to 2 hours. Under these conditions numerous fusion and fission events of M. ciliaphorus were observed. Figure 1: Mechanococcus ciliaphorus: Whole organism (A), single cilia (B) and basal body of cilia (C). Mechanical agitation was essential for propagation of M. ciliaphorus, even without the presence of a gas phase. A possible significance of agitation in mediating access to compounds from the gas phase therefore can be excluded. Given the relative lack of energy sources in the oceans of Dagon 3, we rather propose that M. ciliaphorus is capable of using mechanical energy stored in the currents and swirls of Dagon 3’s oceans for primary production (Mechanosynthesis). This capacity of M. ciliaphorus and of possibly other organisms could explain the existence of a rich biosphere on Dagon 3 inspite of the absence of significant sources of energy driving this biosphere. Cilia on the surface of M. ciliaphorus are prime candidates as essential components in mechanosynthesis. Laser-assisted ablation of these cilia resulted in reduced propagation rates or death of the organisms depending on the number of cilia destroyed. Cilia are anchored in the cell wall. Their basal end is located within M. ciliaphorus cells and is surrounded by a complex structure attached to the cell wall (figure 1C, 2). This structure allows passive movements of cilia, accompanied by changes in basal bodies‘ fine structures (red components in figure 1A, B and 2). Laser-assisted ablation of moving components from basal bodies had similar effects as ablation of complete cilia. M. ciliaphorus basal cilial bodies are therefore suggested to constitute essential elements of mechanosynthesis in M. ciliaphorus. Figure 2: Cilial basis from Mechanococcus ciliaphorus. Components with structural shifts in response to interactions with the cilial basis are given in red colour.